Ariel is a Hubspot Inbound Certified blogger, copywriter specializing in autoresponders, and social media manager for hire. She enjoys testing SaaS products, diving into Twitter analytics, and reading Jane Austen novels. When she’s not typing away on her Mac and drinking copious amounts of coffee, she enjoys spending time with her amazing boys. SEO is like the Kim Kardashian of the online marketing world. You either love it or you hate it, but either way, you still find your way back to it. The subject of SEO is one that many of us spend tireless hours, days and even years trying to understand, which is really hard to do with Google always changing the rules without coming right out and sayin’ what they’ve changed. When most of us think of SEO, we think of ranking a website for certain keywords in order to gain traffic to said site. However, when you throw in the idea of Local SEO, many people are thrown for a loop. Why? Because ranking for local search takes a different approach than what you would traditionally do to rank a website. This leaves many people confused and wondering how to get their site to page one or if it’s even possible. Just like any other SEO tactic, things are subject to change at the drop of the hat, but so far, the list below is a great place to start when trying to rank your business in the local search results. But first, let’s talk about why Local SEO is different and if everyone should implement Local SEO tactics for their site. Local SEO Versus “Normal” SEO: Are They Different? Simple answer: Yes, they’re different. While they’re similar, local SEO typically has a geographical component that organic SEO doesn’t. It’s primarily focused on building signals or relevance and reliability around a brick and mortar location or series of locations. Essentially, ranking in Google’s Local Search takes the approach of nailing down that you are, in fact, a locally based business. In fact, there are things about Local SEO that leave the rules you often hear about for Organic Search ranking at the door and there are things you’ll have to do to rank your website locally that you would (almost) never have to do for what we call “normal” SEO. This can make this a bit confusing, but in my experience, with a bit of time and practice, it’s actually considerably easier to rank a page of website for Google’s Local SERPs than in Organic (normal) SEO. Should Everyone Implement Local SEO Tactics? Again, the straightforward answer: No. Local SEO can and should be used for businesses that serve a certain geographical location, but if it doesn’t, then trying to rank your site in Google for this purpose would be completely useless. For example, it would make sense if a brick and mortar company tried to rank its site to show up in local searches because they are trying to kick up business from their local area since that is where they are located. On the other hand, say you’re a blogger or affiliate marketer who writes about clocks or something off topic like that. Since you’re likely focusing on targeting a keyword and the interest of a larger target group than just a local audience, then ranking your site for your local area isn’t going to do you any good because you’re not generating income for those people. Essentially, Local SEO works best and is best for businesses (big and small) who are looking to get business and leads from their local area. If you serve both a local audience and a global one, then Local SEO will still have its benefits. Below is a list in no particular order of things you’ll want to do to help you rank high in Local SERPs — both desktop and mobile search too. According to the 2014 Moz Local Search Ranking Factors using your City and State in the title of your landing pages was the number one factor in high ranking sites. The lesson here is pretty simple then: place your city and state in the title of your page. Also, the link above is very intriguing and enlightening read so you should definitely take the time to read through it. Not so surprising is the fact that Domain Authority is a ranking factor in Local SERPS, however, creating a site that has this can be a bit confusing. In this regard too, ranking a site in local searches is similar to ranking a site in local searches. Basically, if you have a user-friendly, mobile optimized site that provides content that is unique and shareable, then you’ll build your domain authority with time which will help keep your ranking in the future. Don’t just put this information in the site’s footer (though this is a good thing to do and I would recommend that too), but be sure that these details are prominent on your Homepage specifically. Another place to pay attention to is your Contact Page. Put the same details there and see about adding a Google Maps to your contact page. It may not exactly help with Local SEO, but it won’t hurt you either. You still want your site to be informative and user-friendly and these small details are often very helpful to people trying to locate you or drive to your place of business. Here is yet another thing that regular SEO tactics and Local SEO have in common. The ALT text of your images is a great way to target some keywords that people use to search for whatever service you provide. As a word of caution, though, you don’t want to go crazy and keyword stuff your pictures (or blog posts), but don’t be afraid to optimize your images for ranking purposes either. The one image that I would suggest using a keyword targeted ALT text is your Logo and then use that same image across all the directories and platforms you list your business on. Fast loading and mobile friendly sites are still something you’re going to want when ranking your site for Local search. With Google’s new mobile algorithm rolling out, if your site isn’t mobile-friendly, then you’re going to get dropped from being shown in searches made on these devices which you really don’t want to happen. If you’re looking for a responsive theme or you’re already an Elegant Themes member, then you’ll be happy to know that Divi is an excellent theme to use for your local business as it is both fast loading and mobile friendly. Just like any other SEO strategy, great content is still a key factor for ranking locally. I can personally speak to the validity of that statement. While helping a local company with their content marketing and SEO, I started to regular post content to their blog that targeted long tail keywords and then promoted it on Google+. The combination of creating fresh, unique and informative content while promoting to Google Circles to have the posts like on the Google Plus platform skyrocketed that site from page 3 to page 1 in Local SERPs. Of course, everyone’s experience is going to be a little different than my own, but the results were something that everyone has been happy with. Considering Google is the big dog, you’ll want to tackle this listing first and you’ll want to do it right. Claiming your Google+ Local Business listing is essential so don’t put this one off. Here is a great article about setting up and optimizing your Google+ Local Listing. Note: Many of the tutorials you’ll find about Google+ Local will be under the topic of Google Places, which was what it used to be called. I’m not a fan of review based business since it only takes one really crazy person to flip out and try to screw you over, but getting legitimate reviews on Google+ will help you with ranking better so don’t be afraid to ask your clients to leave a nice review for you. Yeah… that’s quite a few, I know. But these links and the consistency of the information found in them does play a factor in your local ranking. You can decide to tackle the job of signing up and getting listed on these major directories yourself. If you do, try to keep an excel sheet showing where you’ve listed your business and the information you’ve entered. The biggest ones that I would focus on are Google, Bing, Yahoo!, Facebook and Yelp. If you want to save yourself some time, you can also sign up for Moz Local which will handle your listings and get things up on all these sites in addition to finding possible duplicate listings that you’ll want to take care of. Price is a reasonable $84 per year which is much cheaper compared to Yahoo Local Works and Yext. I don’t mean nap, I mean NAP (Name, Address, and Phone Number). According to research done by Moz, a consistent NAP is crucial. When you’re placing your business in various directories your need to have a physical address to use and you want to make sure that all the information you enter will be the same across every platform. This sort of leads off the point above, but it’s important to mention nonetheless. If you already have a site or local business that has been up and running for a while and you’re trying to rank higher in Local searches, then use the Moz Local Listing Search to see if your information is correct or if you need to change or add anything. Yes, using the name of the city you plan to service in your business name does in fact help you rank better in Google’s Local Search. Personally, I find this rather stupid because of how easy it can be to take advantage of the Local SERPs (plus it goes against some of Google’s other “SEO Laws” when ranking sites for general topics), but Google hasn’t seemed to pick up on it yet. For example, say you service San Diego, California as a window cleaner. 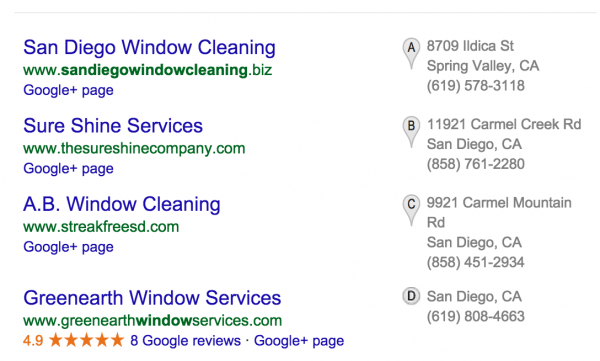 If you called your business San Diego Window Cleaning with a URL to match and a Google Business page with the same name, then Google will favor your list over someone else’s company that has a more brandable name but who doesn’t have the city’s name in it. You can see exactly what I mean in this screen shot below. Obviously, Google could catch on to this and flip the switch at the drop of a hat, but for now, this approach does give the upper hand for ranking higher in Local searches. If you’ve been struggling to understand how to rank for Local SEO or what factors play into it, then I suggest going back through the article and clicking on the links in the various sections of the post. Many of the points I’ve made in this article are based on the data-driven research made by others much smart than me on this topic, so going right to the source for clarification and education is another way to help mentally figure this stuff out. I’m sure that many of you guys here in the community have tips tor tactics to share. What has or has not worked for you when ranking for Google Local?